2016 has seen what appears to be the end of the Pearson family saga with the release of Phantasm: Ravager, the fifth and final film in the Phantasm series, which just hit Blu-ray this week along with J.J. Abrams’ remastered edition of the 1979 original. 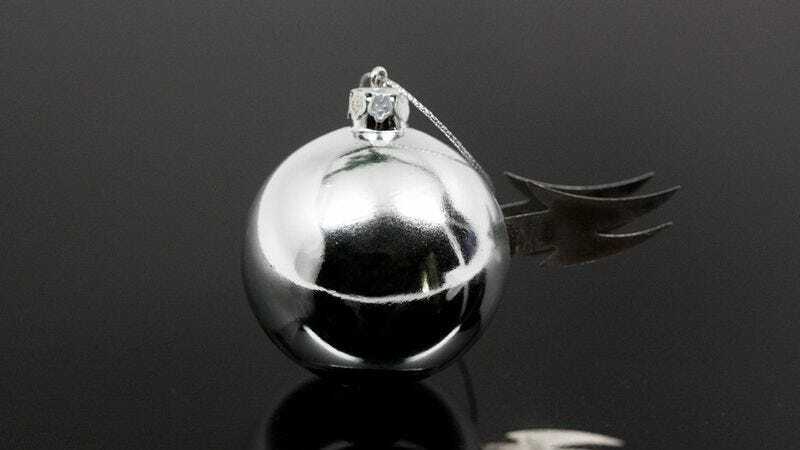 To commemorate the release, Mondo is now taking pre-orders for its Phantasm Sentinel Sphere Christmas tree ornament—a perfect stocking stuffer for all the good little girls and boooooooys. The creation of the Sentinel Sphere was a collaboration between Mondo, Middle Of Beyond, and Phantasm writer/director Don Coscarelli. The Sphere was the Tall Man’s main weapon against Mike, Jody, and Reggie, drilling into the noggins of its victims and spraying blood all over the mortuary floor, much to the chagrin of the night janitor. It’s hard to pen an impartial news piece on this thing. Let’s face it, it’s hot as love, and really, about 37 years too late. How did it take us as a species this long to finally have an official Phantasm ornament? Releasing a Sentinel Sphere ornament actually makes more sense than most of the film and its sequels, as kids with no boundaries have been breaking their parents’ glass ornaments for years pretending they’re the Tall Man. Unfortunately, you’ll have to wait until next Christmas to add it to your tree/non-denominational brush, as the ornament won’t be shipping until January of 2017. That is, unless you just keep the damn thing up until June.